For the past thirty years, my primary focus has been on the evocative power of color. As a painter with instinctual leanings toward Minimalism, the monochrome has served me well as a format for color exploration. Though my approach has changed dramatically over the years, my fixation on the objectness of a painting has remained steadfast. Early iterations included thick, textured paint applications on wood panels, followed by pristine rolled acrylic surfaces on plywood. In the late nineties, I began altering and carving the substrate itself in an attempt to further activate the color experience. Gradually I abandoned the square and rectangular format altogether and in the process, emancipated the support from its geometric constraints. This allowed for a more physical embrace of color's expressive potential and in turn, forced a radical change in materials. 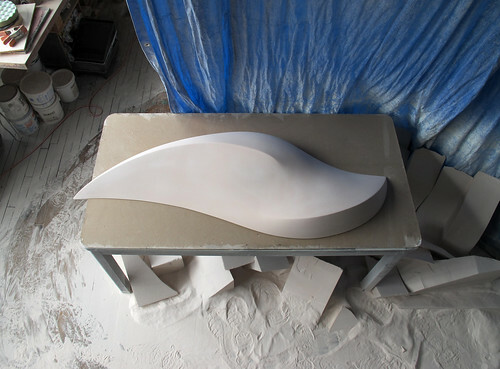 The forms that I have been creating for the past fifteen years are hand-carved from dense polyurethane blocks (HDU) and then spray-coated with roughly twenty layers of automotive primer, custom-mixed color, and clear acrylic urethane. They are typically wall mounted and in some cases, grouped in constellations. In recent years, the dimensions of my work have gradually increased but the resulting forms remain on a human scale. All of the work is executed in my studio and done without the aid of design software or industrial cutting machines. I make no apologies for embracing the ideal of natural beauty and, like many artists, don’t consider myself to be aligned with any particular movement. If I can create a unique and evocative object – one that offers a self-charging visual energy source – then I am content. Throughout my entire career, I have searched for new ideas with a restless and at times, impatient spirit – loath to repeat myself, and always anxious to explore new territory.